Organisers of the French Grand Prix, which returns to the schedule in 2018 after an absence of ten years, admit that despite the addition of a chicane on the legendary Mistral Straight, the cars will still exceed 210 mph. While the Circuit Paul Ricard last hosted the French Grand Prix in 1990, it hosted F1 tyre tests last year and again this year, with Mercedes scheduled for a two-day visit after next month's Italian Grand Prix. The track, which first hosted F1 in 1970, was the scene of the French Grand Prix on 14 occasions before the event moved to Magny Cours, mainly for political reasons. Though the Grand Prix was no more, the track, which was purchased in 1999 by Excelis, a company owned by Bernie Ecclestone, it became one of the world's foremost test tracks as well as hosting a multitude of other events. While next year's Grand Prix will see the full 3.6 mile (5.8 km) layout used - the facility has 167 different configurations - organisers have confirmed that the 1.1 mile (1.8 km) Mistral Strait will feature a chicane in an attempt to reduce speeds, nonetheless cars are expected to reach over 210 mph before the chicane and through the corner at the end (Signes), which will be taken "flat-out". "The FIA did some research and the speed before the chicane will be 343km/h, so the chicane is useful," said Gilles Dufeigneux, managing director of the French Grand Prix, according to Motorsport.com. "The chicane has been added to prevent the engines from running at full speed on a straight uphill line of 1.8km," he revealed. 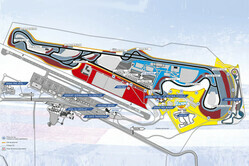 "We also wanted to facilitate the creation of an additional overtaking area. 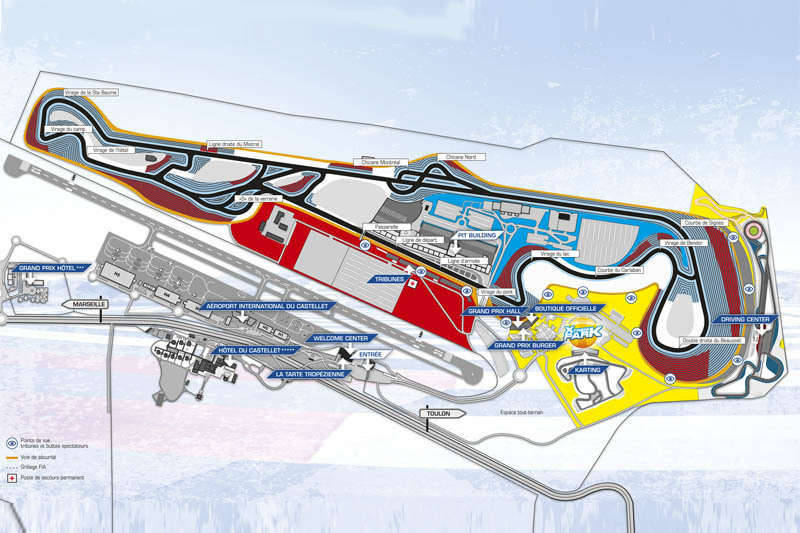 "It will provide three straight lines where the cars can go at full speed before two massive decelerations, Turn 1 and Turn 8 and a flat out turn... Signes. "According to the FIA, cars will reach 343km/h before the chicane and 343km/h at the apex of Signes. The drivers have told us the chicane will probably be an opportunity for non-DRS overtakes during the race. "We presented the new configuration of the circuit during the Austrian Grand Prix weekend to several drivers including Lewis Hamilton, Sebastian Vettel and Fernando Alonso," he revealed. "They liked it and said the 5.8km configuration was a nice option." The Grand Prix forms part of the sport's first ever 'triple-header', whereby it will be followed by the Austrian and British rounds over the course of three weekends at the end of June, beginning of July. Vettel stalling on Ferrari future?